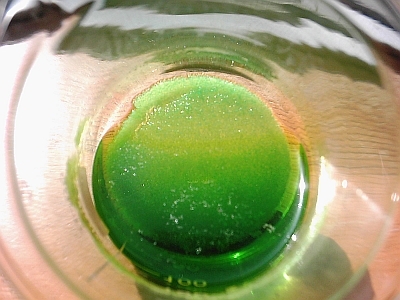 3 grams of copper was dissolved in Nitric acid, then the acid was evaporated and water added to redissolve the crystals. The copper was then precipitated with lye. 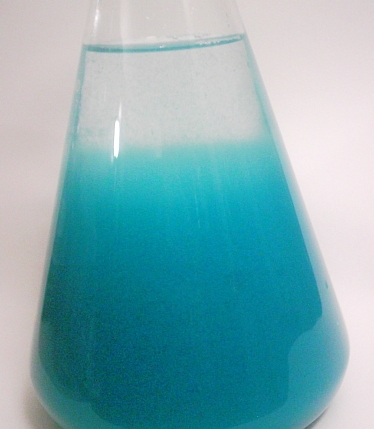 The copper hydroxide was then dissolved in hydrochloric acid and most of the acid was evaporated until crystals began to form. 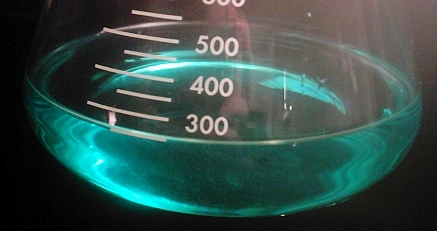 The copper chloride crystals were dissolved in 250ml of water and turned from green to blue. 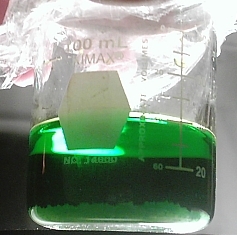 At this point it has a lot of color because the solution is so concentrated. 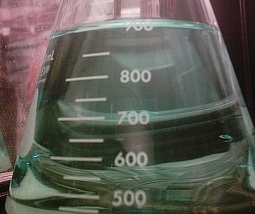 Here is the solution diluted up to 900ml with more water. Click on the image to watch a short video of the pH being adjusted to alkaline. 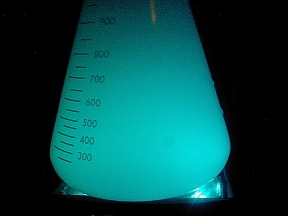 Here the copper hydroxide is shown illuminated by the blue light of a magnetic stirrer. Using a stir rod by hand can slow things down quite a bit when 100 pH swings need to be done. 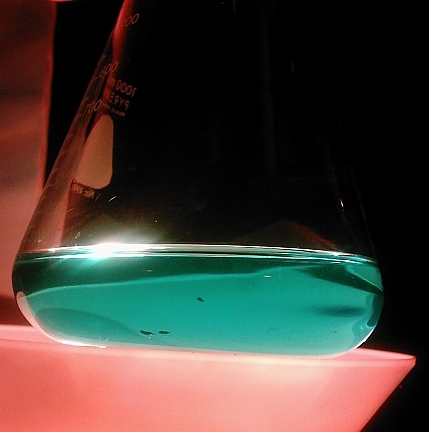 Here is the turquoise copper hydroxide precipitant. After being gently dried to a powder, it is a clax which can be converted to a volatile oil by use of our Philosophical Mercury. But it's best to do more pH Swings on the copper until it is a white powder. It's then much easier for the Philosophical Mercury to dissolve it down to it's first matter. 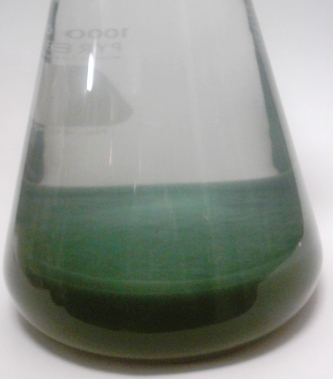 After several hours, the precipitant has settled and has become dark green. This is due to copper atoms recombining and forming larger clusters. The fact copper hydroxide has this tendancy is what makes it so stuborn to work with.